Saturday was our monthly North Texas GIG support group meeting. 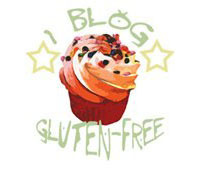 Nancy Lapid, celiac disease writer for About.com, spoke to us about the internet and gluten intolerance/celiac disease. Not only did she have some excellent information, but she was also very funny! Hot Chocolates, a bakery in Hurst, TX, has been making gluten-free goodies for a few months now. I recently spoke with them and found out some great things. Of course, they always start with clean hands and equipment, and the gluten-free cakes are made at separate times from the gluten cakes. Currently, they have 9 flavors of gluten-free cake. They also hand make over 40 varieties of chocolate candy, the majority being gluten-free. I bet you are wondering how they taste. I was, too, especially when they donated 4 dozen cupcakes to our support group meeting. Half of them were vanilla with chocolate frosting. The other half? Red velvet, my favorite. Judith cut them into quarters, so there were a few leftover. Of course, the terrible task of taking the last ones fell to me. They were good the next day, while I was working so hard to bag them up and freeze them so I wouldn’t eat them all. Wasted effort, really. I froze them, and we unanimously agreed that they are great straight out of the freezer. Both the cake and the frosting are airy enough that you can still sink your teeth into them while frozen. And… I’m feeling a little sad… and guilty. You can have a look at some pictures of the poor, mutilated cupcakes (but oh so yummy), and the rest of the spread here. We had so much food for a regular Saturday morning! There are also some pictures of Nancy speaking. Unfortunately, I didn’t get my camera out in time to capture the beauty of the cupcakes, or anything else (like Ciara’s pretty cake). These pictures were taken right after the meeting started. As you can see, half the food was already gone at that point. So, if you’re ever in the Fort Worth area on the first Saturday of a month (or May 16th, for our walk), look us up and come visit! Give Hot Chocolates a call, too, and get yourself some treats. Those sound absolutely delicious! I have to admit I’m a little jealous! When I lived in NYC there was gluten free baked goods a-plenty, but now that I’m in cleveland, if I want some, I have to bake my own. Of course…that’s motivation to start up one of these cupcake shops here, hmmm….